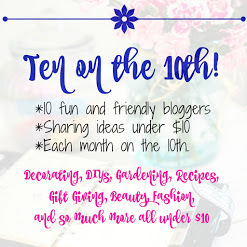 Welcome to Ten on the 10th. I'm so excited you are here. 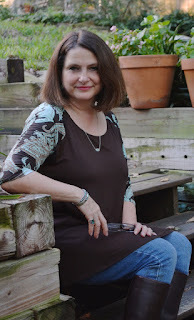 We have a great group of bloggers ready to share their posts highlighting thrift store makeovers. This is going to be fun. Look for the link list at the end of this post. 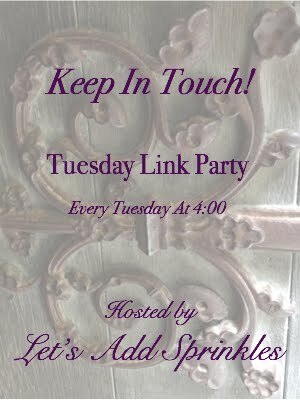 You"ll be able to link up your own thrift store finds, makeovers or upcycles as well. 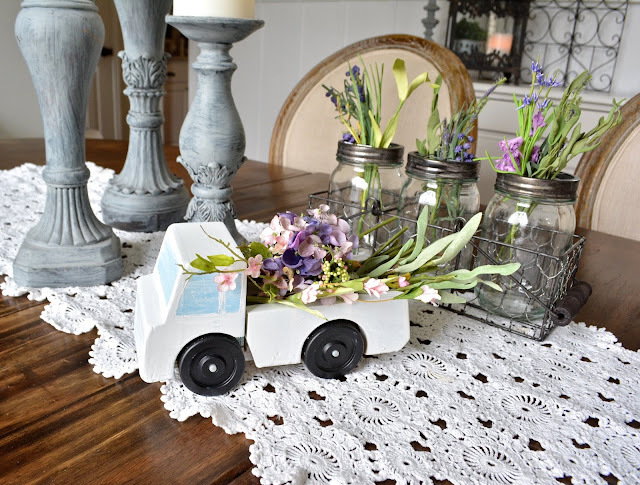 You may remember that I have had pick up trucks sprinkled through out my decor of late. Used toy pick ups are a hot commodity in Texas. We like our trucks down here. I know I love mine. 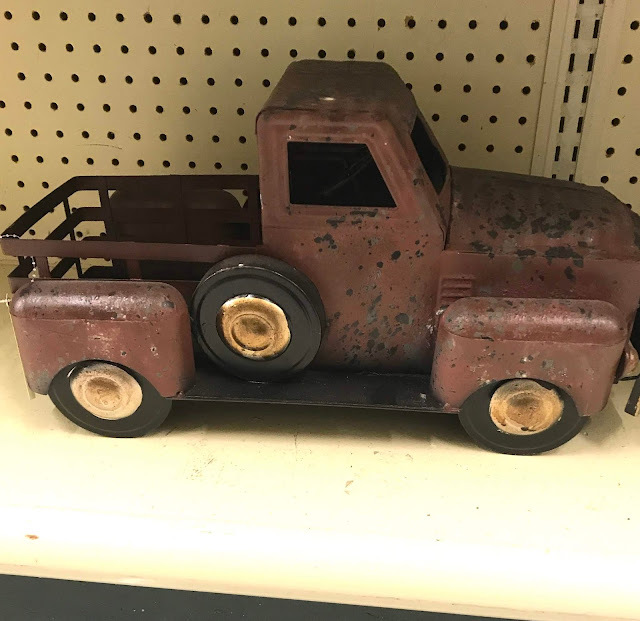 For years, I've not been able to find a vintage toy pick up truck for a price or in a color I want. This has been an illusive item to find. They are always orange or turquoise or outrageously expensive. My thrift store has a good vintage section and a pretty good toy section. A few weeks ago, I was searching for a truck to no avail. A wooden garbage truck caught my attention and the Ten on the 10th challenge came to mind. Could this little garbage truck be transformed into a pick up? I plopped it into my cart. For $2.00, it was worth a try. The orange plastic garbage can lift snapped right off. Hitting the top gently with a hammer caused it to pop off as well. Once that was done, the sides and the piece that rested up against the cab were easy to remove. The sides were cut down with the table saw to make the bed of the truck. So the wood wouldn't split, I used the drill to make pilot holes and then nailed the sides back on with small finishing nails. It needed paint. Part of me liked the green and turquoise so I tried painting just the bed. To prevent paint from getting on the wheels, I taped them off with painter's tape. Tin foil was used to cover the truck cab. When it was painted and the foil was taken off, it looked unfinished. 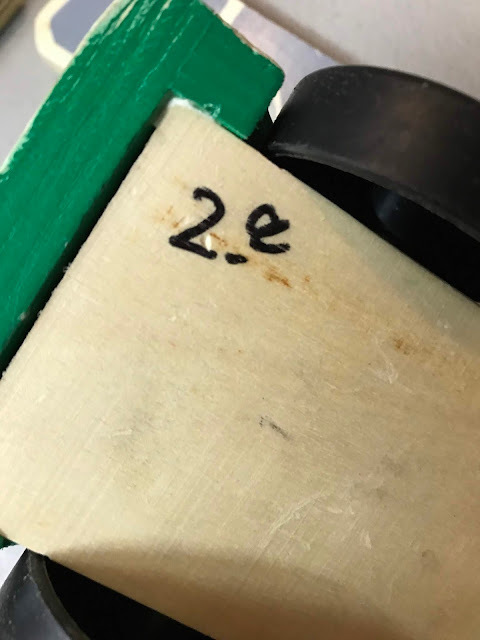 Sadly, I'd also taken the tape off of the wheels. They were meticulously re-taped. I taped the windows and grill and finally the green cab got two coats of white. My taping job was less than perfect and the blue glass and gray grill looked bad. White acrylic craft paint was dry brushed over the windows and grill to tone them down a bit and make the imperfections appear less noticeable. It's been decorated for Valentine's Day with silk roses. Here it is decorated for Easter. 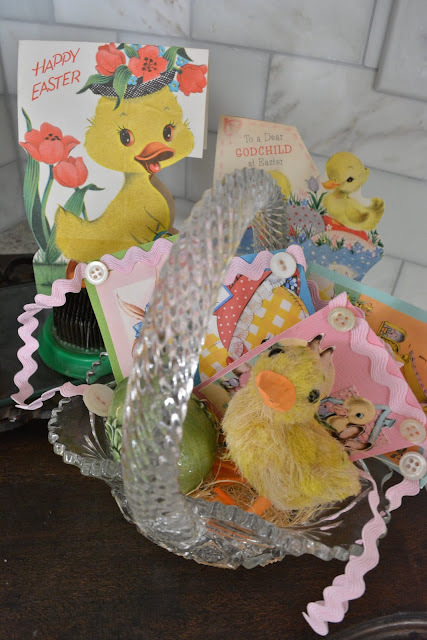 It's cute and springy with or without the bunny. Pick up trucks in design are still trending. I've seen them at Hobby Lobby and at one of our local boutiques. There was also a black one either at Joann's or Michaels. I can't remember which. 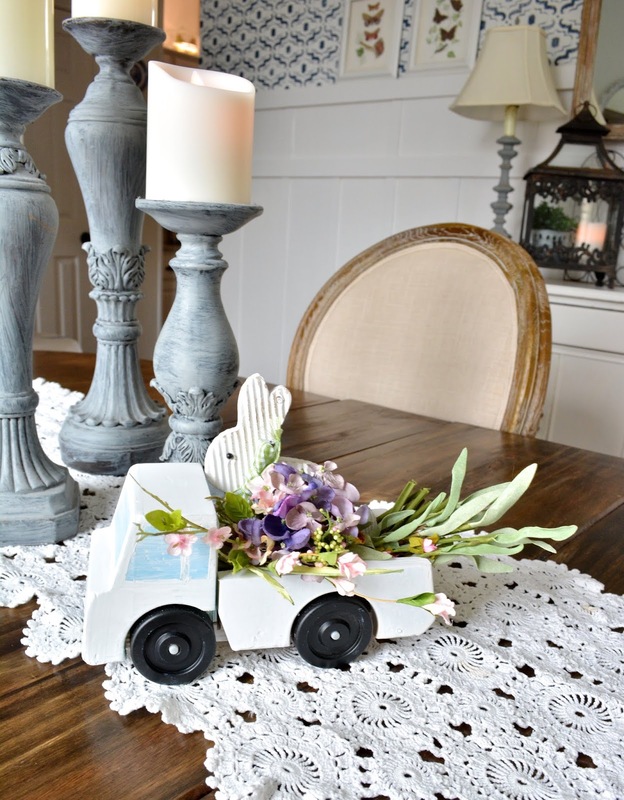 I've enjoyed this darling truck on the dining room table. 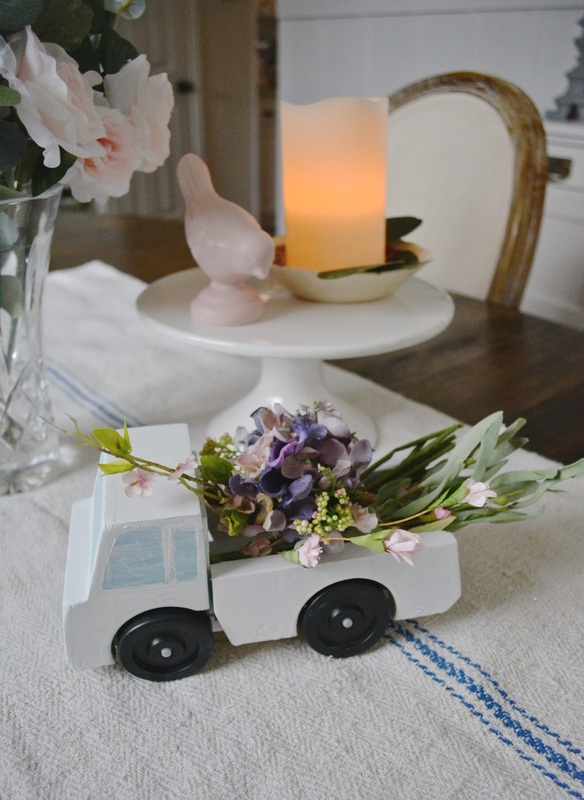 It adds a cute bit of whimsy to our centerpiece. I wasn't sure this was going to work. It's fun that it did. Let me know what you think in the comment section. If you like it-Pin it! Be sure to check out these other fabulous bloggers. Link your own thrift store makeovers below. How cute!!! That is a great idea, I might just have to raid my grandson's truck collection! Katie you did a wonderful transformation! So cute!!!! 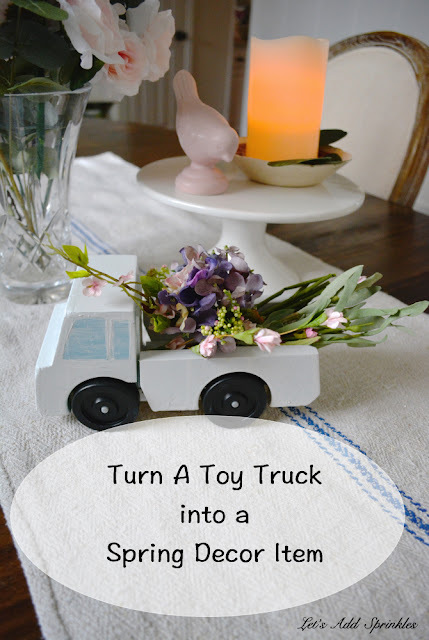 I bought an old truck a couple of years ago at our local antique store and I use it all of the time. I'm sure you will use this one too. Awesome job! Also, thanks for being our fearless leader this month. You Rock! What a great transformation! You'll be able to enjoy using this for decor in any season. 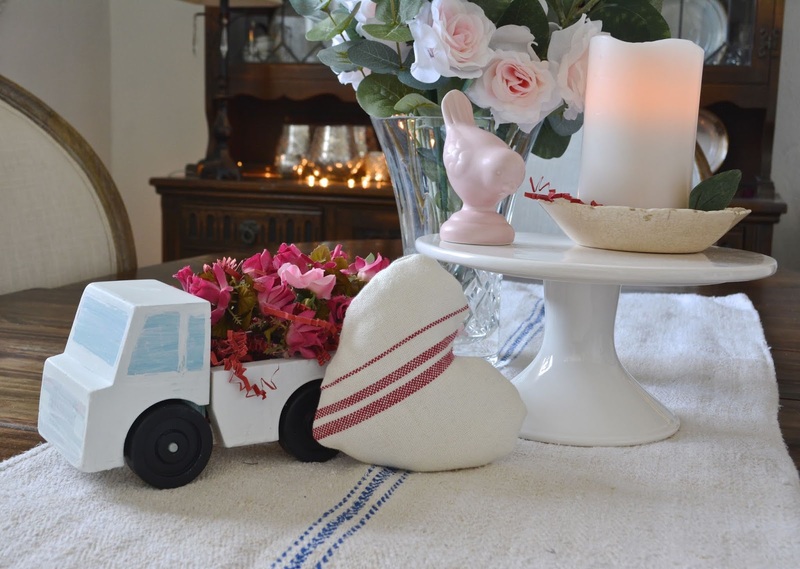 Love your truck! I believe I've seen that garbage truck frequently in thrift stores or flea markets but didn't consider taking it apart. You're very clever! 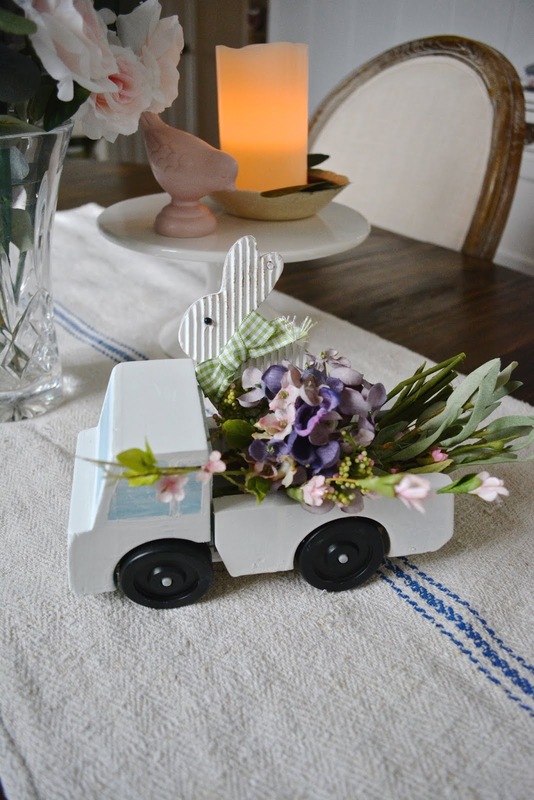 I love the finished product - even better than the Little Red Trucks! Is the white rabbit behind the truck galvanized metal or corrugated cardboard? It's very cute! I love this truck! How creative and it looks adorable. I think it is great that you can change the bed decor out to match the seasons...how cute is it going to look with tiny pumpkins for the fall and tiny Christmas trees?! Great job Katie! Have a great one! Hugs! Love this idea....and you made it look so pretty....also love those candlesticks!! I would never have thought to remake a garbage truck into a little truck. 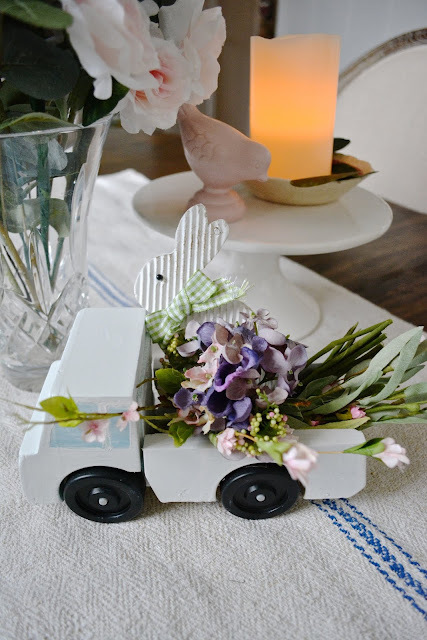 It looks so cute in your vignettes. You are so clever for even seeing the potential in that garbage truck! I am amazed at the transformation. It's so stinkin cute. I know you'll have fun decorating that for several occasions. Absolutely adorable Katie! 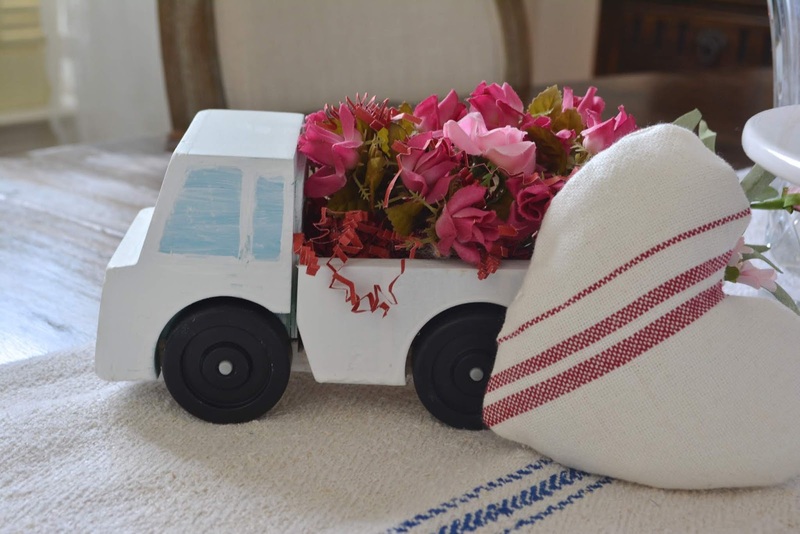 How clever is this darling truck toting a truckload of flowers and versatile too! 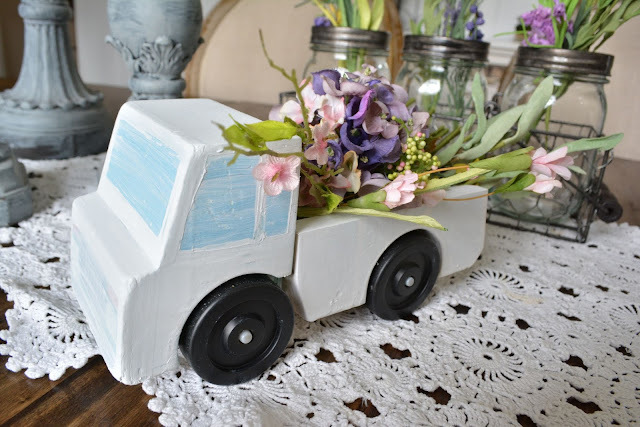 Your little truck is just adorable. I tend to skip the toy department at thrift stores. I'll be rethinking that! You are so talented! Love the little truck. I will be looking at the "toy" section from now on. 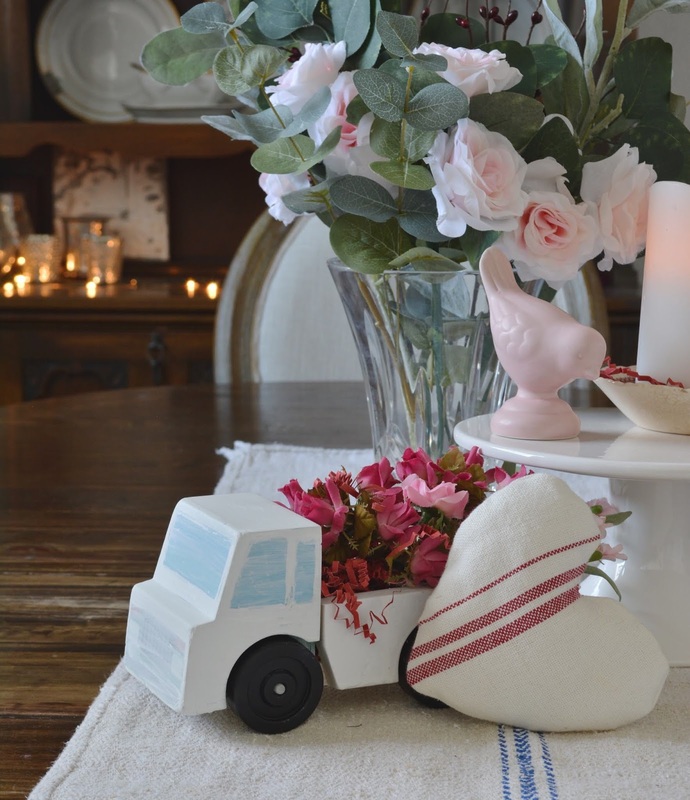 Just darling, Katie and I love how it can be used for every season! The truck makeover looks nothing like the original... in a great way. 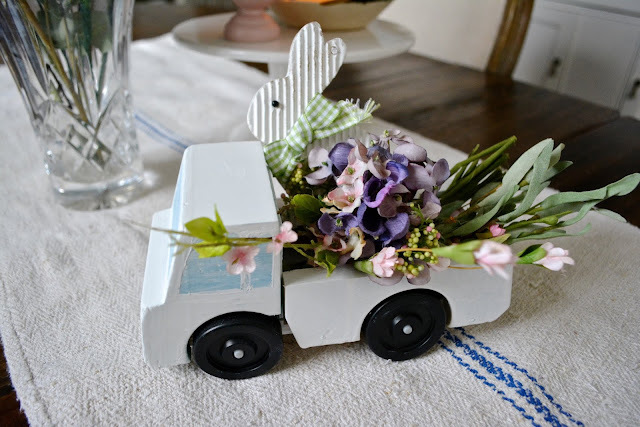 The truck decorated for Easter is so pretty! Awfully cute, Katie! Nice job! Oh my goodness Katie this is such a cute and clever project! Has the Easter bunny ever had a sweeter ride? Have a love filled week! Katie, the truck is darling and I love the blue and white. I'm really impressed. I didn't know you had a table saw!! I need a lesson. I think you had an earlier truck project. I would love to find one. 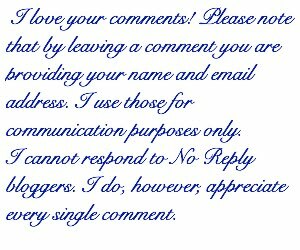 Thank you so much for hosting this month. What a talented group of ladies here. Cute idea, Katie. I passed up the cutest antique flower farm truck at Marburger on year. I still think about it! So stinking cute!! I love this. I have been looking for trucks to makeover at my thrift store, but boy they're hard to come by. Lucky girl!